The memories we treasure from childhood are the times we felt free to be who we were — kids. To us, the freedom of being on the playground was the most incredible feeling in the world. 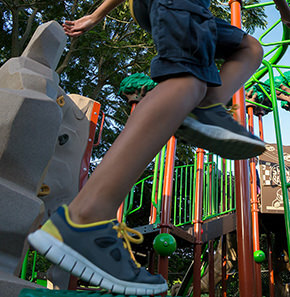 Outdoor playgrounds remain one of the few places where kids can let loose and play. With more and more children are tied to TVs, tablets and video games, having fun on a playground is an essential aspect of childhood physical fitness and an opportunity for growth and development. While many daycares today have adopted educational activities, play still encompasses a large portion of a child’s day. After some time indoors, the kids at your daycare are probably bursting at the seams to break free on the playground. As the adults who care for these young ones, your job is to ensure these play areas are safe. Despite the many benefits of having a playground at daycare, there are hazard considerations that you must keep in mind to ensure that all of the children in your care remain safe. Keeping your playground safe means that children will be able to enjoy the benefits of playing on it for years to come. The reason we build playgrounds is to give our young children an opportunity to get outdoors, learn and grow. Kids need to develop their muscles and exercise as much as they need to improve their minds. It sets them up to be healthy, well-rounded individuals. As kids move around and play, it promotes physical fitness and healthy exercise habits, too. 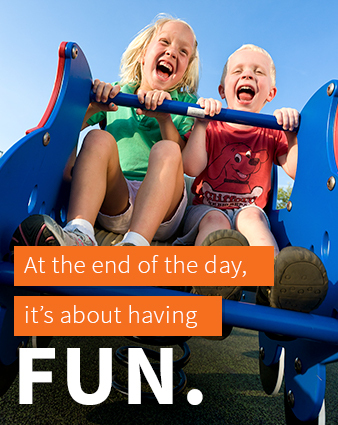 At the end of the day, it’s about having fun. Kids need to gain a sense of identity and independence, and a playground is a safe place where they can discover more about who they are. By using their imagination and engaging actively in play, kids are preparing themselves to be creative problem solvers who are ready for pre-school, kindergarten and beyond. Although we want our kids’ experiences on the playground to be an unobstructed time of pure enjoyment, playground equipment can become broken or damaged over time. Also, our friend Mother Nature sometimes likes to throw some surprises our way, like extreme temperatures and hazardous little critters, for example. It is the responsibility of daycare staff to ensure that everything is safe for the children to play freely. There’s nothing quite like a beautiful new playground. 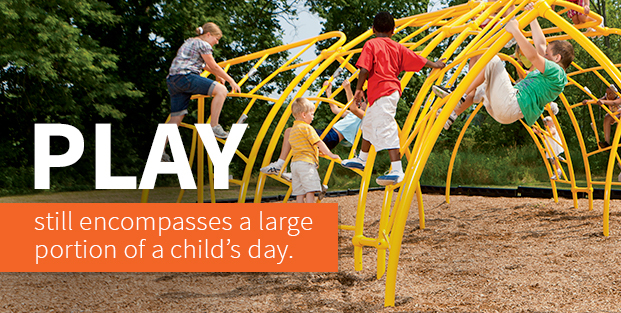 Whether you’re a child or just a kid at heart, playgrounds inspire excitement at the play possibilities. But, over time, the shiny paint and colorful plastics begin to fade, and safety hazards become a distinct possibility — that’s where the adult responsibility comes in. There are a few necessary things we can do to make sure all the equipment is safe for the children to play on. Maintenance issues can cause kids to fall, get scratched or scraped or lead to other injuries. That’s why it’s essential for the adults in charge to check all the playground equipment regularly for any potential safety hazards. Chances are, kids will still get bumps and bruises every so often — that’s the nature of children playing. These things happen. But, examining the equipment will help make sure that no injuries are due to broken, damaged or otherwise unsuitable playground equipment. Plan periodic safety inspections on a regular basis. You can walk around the playground and see if there are any visible signs that you should repair or replace any of your equipment. Here are three things you can look for as you check for safety hazards. The first thing to check for when you’re inspecting the playground is equipment that may be worn or broken. The materials used to construct playgrounds should be durable, able to stand up to all kinds of weather and the pitter patter of little feet pounding on it every day. But, even the best playgrounds require a little TLC from time to time. It may not be evident at first that something is broken, so it’s essential to get an up-close look. Before your daycare kids prepare to play, make sure there is no observable damage. Broken equipment is usually pretty obvious — you can see it with your eyes. But if a playground structure has become loose, you may not know until it’s too late. That is unless you catch it before it becomes a dangerous situation. As part of your periodic safety inspection, make sure all the playground structures are secure. Shake them or move them in ways you know the kids would. This way, you can tell if something is not secured correctly. As kids are running and jumping around the playground, we may not be aware that one of the most critical safety features lies beneath their feet. A proper ground surface not only reduces injury, but it also can limit how severe an injury can be. There are many options when it comes to surface materials, but it needs to be soft and thick enough to soften the impact of a fall. However, even these groundcovers can lose their effectiveness over time. The combination of weather and the tireless running of little feet can cause loose-fill surfaces to shift or unitary playground surfacing to become damaged. Make sure the ground is covered with appropriate surfacing with at least a six-foot perimeter around the equipment. When you do your safety inspection, make a note of any areas that need more fill. If you’re not sure what appropriate surfacing depths are for the specific playground equipment at your daycare, contact an expert for assistance. Tripping and slipping hazards are another concern. Rain, mud, ice and snow can cause playground surface materials and platforms to become slippery. Your kids may need to wait to play if that’s the case. You should also check for loose debris and remove anything that’s a tripping hazard. Pay particular attention to ensure there’s nothing that could hurt a child if they fell, like sharp sticks, glass or metal. If you notice any of the safety hazards mentioned above during your regular playground inspection, then you need to take care of it as soon as possible. The daycare staff can take care of some things, like loose screws or hazardous debris. However, you should hire a professional to either repair any significantly damaged equipment. Make sure you designate the broken equipment as off-limits and tell all the children not to play on it until it is in working order again. Then, either hire a professional who can fix it, or search for new, exciting options to add to your play space. Daycare workers know how important routine is to children, but it also helps out adults, too. A lot of things can go wrong out of the safe confines of the classroom or playroom, and Mother Nature likes to throw plenty of curveballs our way. 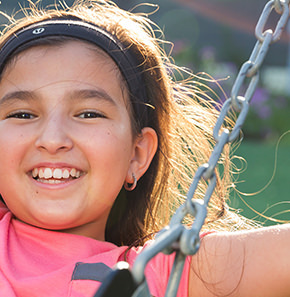 To ensure your time on the playground is as safe and fun for your kids as possible, you might want to consider using a daily playground checklist. A playground checklist is a guide the workers at your daycare can use to ensure everyone is on the same page about outdoor playground safety. It includes tips and information to follow every time they bring the kids out to the playground. The checklist functions as a reminder of what workers should look out for before letting the kids out to play. Every daycare has its own needs, so your list should reflect your unique surroundings. For example, a fenced-in playground with pour in place surfacing won’t have the same concerns as an open playground in a rural setting with loose-fill surfacing. Either way, here are four items you will likely want to include on your daycare’s daily playground checklist. Whether it’s hot or cold, your kids will probably want to play outside. But, as the adult, you need to be aware of the appropriate weather for playground time. Before you even consider heading outdoors, check the forecast. Nowadays, this simple task is easier than ever with readily available technology. If you have a smartphone, not only will it tell you the temperature, but it will also tell you what it actually feels like outside. 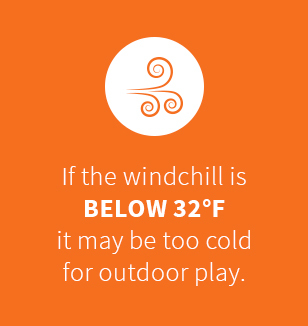 Windchill plays a considerable role in whether it’s comfortable to be outdoors. It also includes an hourly forecast, so you can foresee if playing outside later that afternoon is feasible. Here are some factors you should consider before taking the kids outside. If you live in a warmer climate, then your kids may not be as acclimated to cooler temperatures as the children in, for example, Michigan. It’s really up to your daycare’s discretion about how cold the temperature is to prevent you from taking the kids outside. However, a good rule of thumb is that if the windchill is below 32 degrees Fahrenheit, it may be too cold for outdoor play. If it is a cold day, be sure to shorten outdoor play for toddlers and younger children to between 15 and 25 minutes. ALWAYS CHECK FOR HOT SURFACES BEFORE ALLOWING CHILDREN TO PLAY. 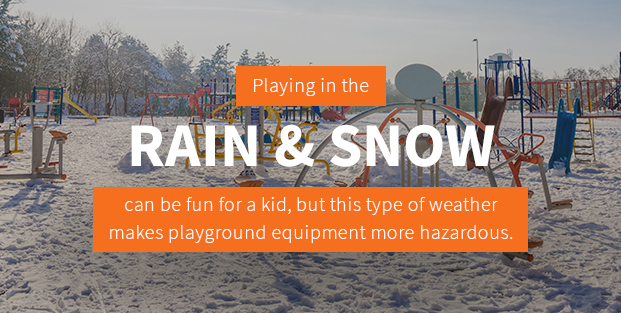 Playing in the rain and snow can be fun for a kid, but this type of weather makes playground equipment more hazardous. Steps and ladders become incredibly slippery, and slides can send the kids careening down at speeds that could frighten or injure them — not to mention getting their backsides wet! In these types of weather situations, it may be best to keep the kids indoors until the playground dries off. Even when the sun comes out, be sure to check the equipment — you may have to designate something that hasn’t dried sufficiently as off-limits. Heat doesn’t only affect the kids, but it can also cause outdoor play equipment to become severely overheated. Daycare workers need to pay particular attention to the temperature of anything a child may touch sit on. Even if the temperature doesn’t feel that hot, the bright sunshine has the potential to heat up plastic and metal equipment. This can result in severe injuries and even 2nd-degree burns. Plastic playground equipment, like those from Playworld, do not conduct as much heat as metal equipment. But even these can get overly warm if they’re in direct sunlight or extreme heat. As the guardian of the playground, be sure you’re aware of how hot all the equipment is before letting the children play. Another item to include on your daily playground checklist is checking for little critters. Wasps, spiders and even furry animals can decide to make their home in playground equipment. You need to make sure that an animal hasn’t taken up residence — otherwise, your kids might find him first. If your children come in contact with hazardous insects, they could get stung or even have a severe allergic reaction. Be sure to check the equipment for wasp nests, spider sacks or anything else that shouldn’t be living there. Another thing to be aware of is animal droppings. They may not be living there, but if they were passing through they may have left a little surprise. Be sure to check the equipment and the surrounding grounds before someone steps in it or unwittingly picks it up. The most significant tools we have to keep our kids safe on the playground are our own two eyes. Adequate supervision means that you will be able to see if children are in need of assistance or are behaving in a way that needs to be corrected. If an accident does happen, you will know exactly what happened and be there to help immediately. Checking equipment and creating a checklist are just some of the aspects of playground safety — establishing rules is the best way you and the children can work together to keep this space safe. No matter the age of the children at your daycare, clearly set rules are an essential part of playground safety. Even toddlers will respect regulations if you enforce them reasonably. You know the kids at your daycare best. These rules are not exhaustive, and we’re sure you’ll come up with a few of your own based on your unique situation and play area components. Our goal is to provide some suggestions based on our many years of experience. Daycare playground safety starts with quality equipment. If you’re in need of new playground equipment, trust Playworld, one of the most trusted names with more than 45 years of experience in the industry. Not only do we provide superb craftsmanship, but we also ensure our equipment is safe and enjoyable for even the littlest explorers. 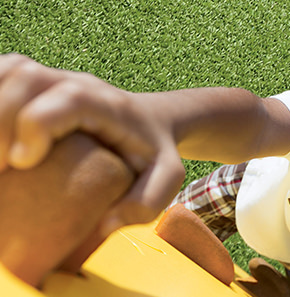 To make sure your daycare playground is as safe and exciting as possible, our team of play experts is here to help. The team can assist you with creating a play area that meets all your daycare’s needs. Plus, they’ll also help you design and plan something both parents and children will adore. Their wealth of knowledge will help you come up with creative solutions for a safer environment, and the result will be a safe space that’s both fun and attractive. Contact a Playworld Play expert today!